This Body is not that Solid is an experimental investigation into the intersections of the perceived solidity of formal structure with the dynamic and transitional nature of sound. 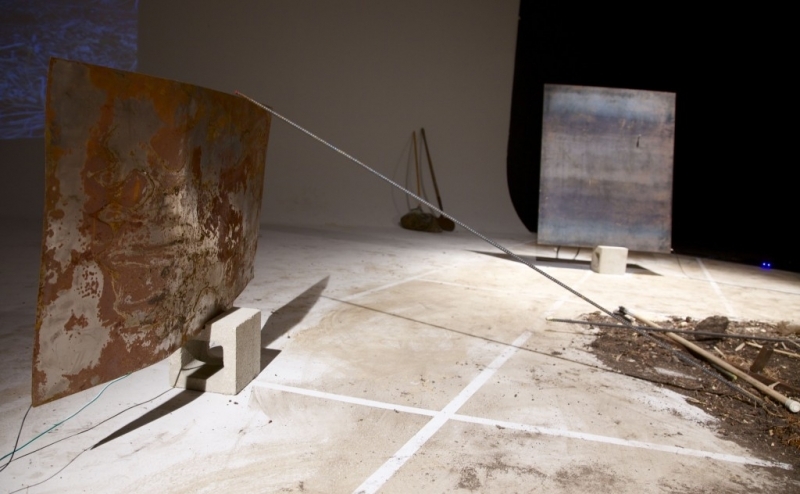 Utilizing video, dirt, large steel sheets, magnets, electronics, and metal scraps, Jules and performers create a series of feedback/reverb loops. As these sounds circle in cacophonic precision, they problematize the ‘being-ness’ of hard steal with their slippery, sonic fluidity. The visibility of this transitional state is located through the perceivable physical change created from sound on and through the body. From Monday, October 21st – Thursday, October 24th, 2013, Jules asked musicians/players to come into the gallery to perform one-minute scores. The players first picked a location on the grid that mapped the floor of the gallery. Based on this position, they were given four variables: pitch, duration, volume, and timbre. Jules recorded these performances using a quad microphone arrangement centered in the middle of the grid. For the performance, Jules re-played these recordings, in the order that they were recorded, sounding through external and steel-sheet speaker elements. Each external quad speaker corresponded to an internal quad microphone, thus attempting to “map” the placement of the performances. The failure to contain these aural ghostings were disrupted and further disoriented from the grid, both sonically and visually, by the bisecting placement of the steel sheets.